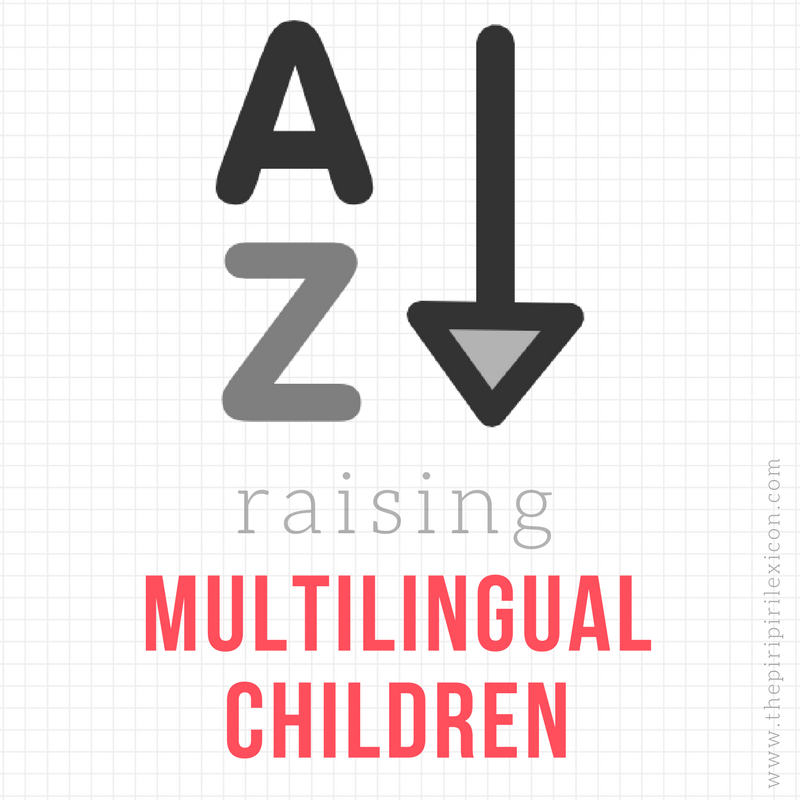 I am closing the current round of Show me your neighbourhood around the world by bringing you a lovely post from a fellow multilingual mum blogger. 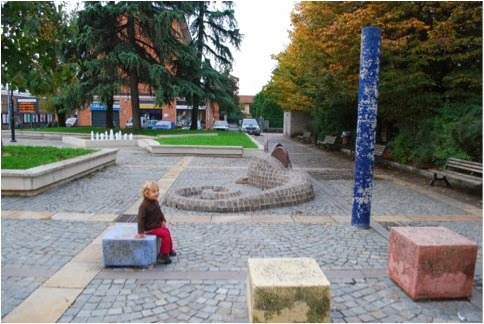 Here is what Galina writes about her little town near Milan, Italy. 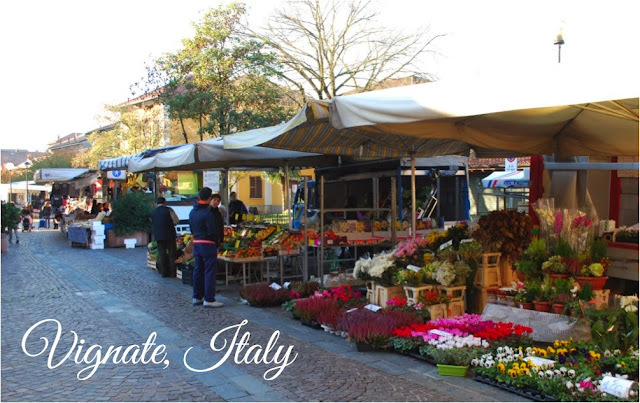 I would like to walk you through a small Italian town that is located East of Milan. It is connected to the city by a suburban train line that in Italian is called “Passante”: 30 minutes ride in a nice comfortable train cabin and you are in downtown Milan! 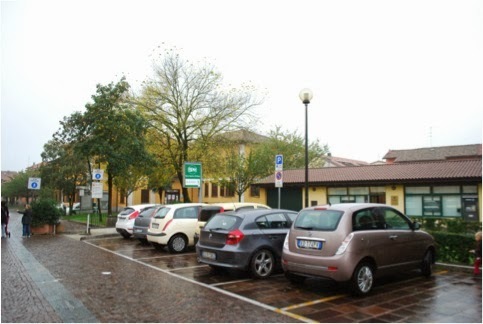 The Milan suburban area is densely populated and therefore traffic can be heavy in the morning, however the bicycle is a popular means of transportation as well since there are convenient bicycle roads connecting local towns and parks together. Also the town is just so small that one can simply reach everything on foot. The town has about 9000 habitants, many of which are children. 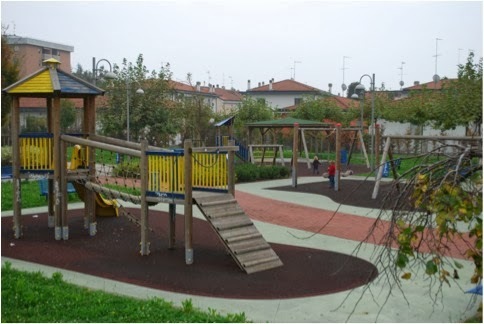 A lot of different playgrounds are available for kids to play and run around. Some of them are small and some are big, some of them are a bit out of date but some of them are modern, some are fenced and some are not. In the fall, I like to bring my kids to a big gated playground that is located just on the other side of the railroad, where one can find lots of space for parties (booking is managed by the community). 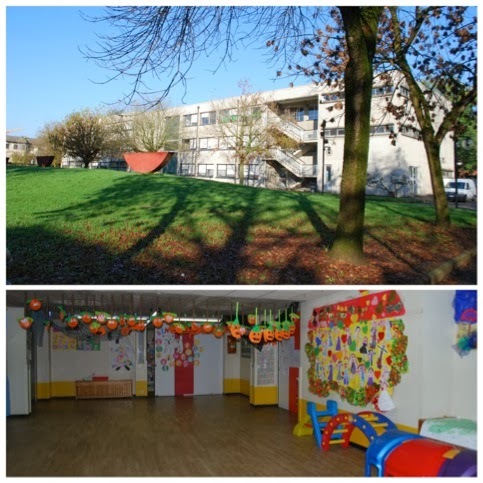 There are two nursery schools (ASILO Nido) and two kindergarten (scuola Materna), one is private and one is public. Then there is one elementary school and one middle school. 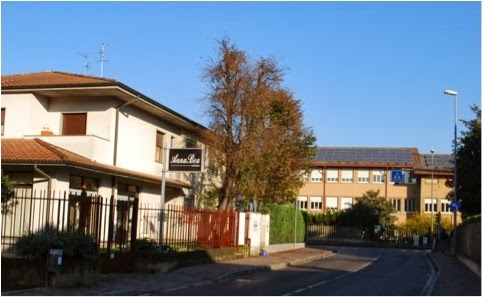 The town is not big enough for having a high school, and teenagers will have to go to bigger towns nearby that are reachable by bus or by train, or even to Milan itself. 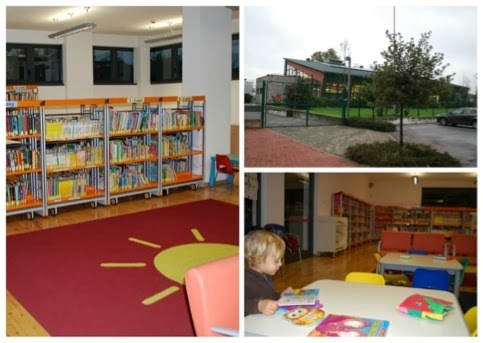 The town has a beautiful library with a dedicated room for children where many interesting events such as musical storytelling or creative drawing are held. In the library children can choose what they would like to read ( there is a small international books section as well) or they can choose to put together a puzzle. Small children will find boxes with soft books and toys. Two size tables and a big rag are available to make everyone feel at home. 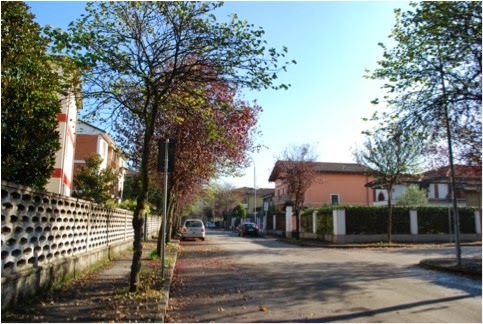 The town does not have many colorful trees to enjoy in the fall but it bursts with colors in the spring and, no matter what, the streets are cheerful with sunshine. Note the solar panels on the middle school building. Great way to use modern technology! As of shopping, nothing can be more comfortable. There are several little shops plus a big shopping mall on the edge of the town, reachable on foot or by bike via a dedicated road. Great place to shop for presents during the Christmas shopping rush and plenty of parking as well. Who could expect that this small town has a food gem, namely a small supermarket where one can buy the best ever hen for soup, mountain lamb, homemade sausages and other meats, not to mention the outstanding cold cut section! 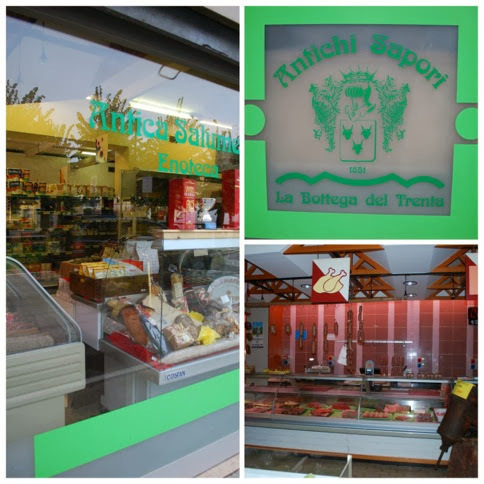 La Bottega del Trenta is listed in the Italian slow food guide “Gambero Rosso” and has a very interesting history that goes back to 1851, when the family Trenta started production of homemade salami of the highest quality. There are no conservation agents or chemical additives are used and the products are aged in the ancients underground cells. 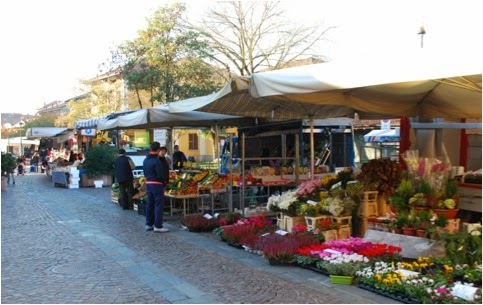 Wednesday is the market day, which offers different food and clothing. Some veggies stands offer a free delivery if you spend around 20 Euros. On the first and the third Friday of the month there is a local produce market with fruits, vegetables, meats, even buffalo products(! ), wine sold directly by the farmers. I noticed that many Italian cities and towns have fountains. Our town is no exception: a water melody keeps people happy while they eat Gelato (Italian ice cream) finding a shelter from the sun under pine trees. A simple resting reptile keeps kids busy playing. 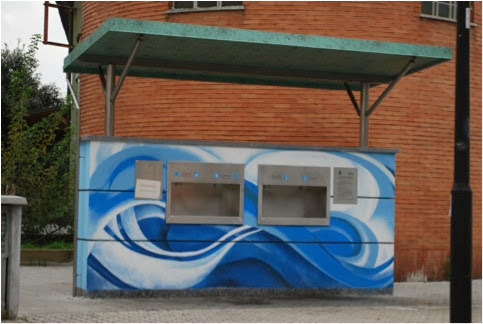 If you by chance visit this town and feel like having a glass of sparkling water after finishing with your gelato, just stop by this purified water facility. Feel free to take as much still or sparkling water home as you wish, it is on the mayor’s account! 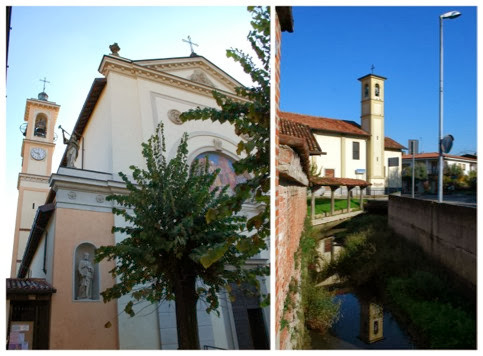 The town has two beautiful XII century churches: Chiesa di S. Ambrogio and di S. Biagio.